To Let, 8-room house with garden, orchard, 9 acres arable & pasture in centre of Harston. Apply Mr William Watson, proprietor, or Mann & Sons, auctioneers. For sale, Mann & Son auctioneers on 27 Jan, at premises of Mr Samuels near The White Horse; 40 ash & elm trees & the materials of a barn & garner & a sow & 7 pigs & market car & a few lots of household furniture. The trees are of excellent quality, deserving attention by coachmakers, wheelwrights, carpenters etc., In a close adjacent to the High Road, a short distance from Harston Railway Station. 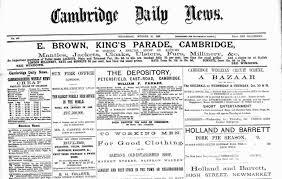 List of members of Cambridge & Cambs Association for the speedy apprehension and effectual prosecution of felons & thieves of every denomination & other persons committing offences in the town & county, on the persons or property of any of the subscribers. William Long is the member for Harston. £29 claim made by William Silk of Cambridge against William Gwilliams of Harston for rent due to his father (dec), Thomas Silk of Harston. (it was claimed that Mr Silk gifted the money to Gwilliams as a friend). Case adjourned. (Mr Tuck of Harston also mentioned). Trees for sale (40 ash & elm), by Mann & Son at premises of Mr Samuels near The White Horse, Harston; also a barn & garner and a sow & 7 pigs, a market cart, furniture etc. Birth of a son to the Hurrells. Cambridge Quarter Sessions Grand Jury included HJ Le Pipre of Harston. John Simons of Harston, charged with assaulting the son of Samuel Ruffles of Harston, case dismissed wth a reprimand. To let, furnished sitting room & bedroom at Harston, apply Jonathan Stockbridge. To be disposed of: baker’s oven, 8-bushel capacity, apply Benjamin Miller of Harston. Combined choirs of Harston, Melbourn, Barrington & Bassingbourn, sang at Melbourn church (+ similar combined-choir events recorded on subsequent dates in this decade). Thomas Cowell of Harston was fined for ‘unjust measures & weights’ (11 earthenware mugs) as was James Tuck (6 do. ), both fined 6d + costs. Richard Hunter, baker, had ‘unstamped weights’, case dismissed on paying costs. Lot 1, Brick & slate dwelling house with good cellar, entrance hall, parlour, keeping room, kitchen, pantry, 3 bedrooms, detached wash house, necessary offices, pump of excellent water, productive garden, fruit trees, circa 1 rood 10 perches. Occupied by Mr William Wallis. Lot 2, Residence with 2 parlours, kitchen, pantry, 5 bedrooms, nececessary offices, workshop, outbuildings, pump of excellent water, area about 2 roods, 20 perches, including garden & fruit trees. Occupied by Mr How. Land taxed. Applications to J. Deacon Fetch Esq., Solicitors, Cambridge. Cambs Mounted Volunteers, 40 gentlemen of the region, got together by HW Pemberton of Ansty Hall, Trumpington, who, by ‘hard training’, have ‘attained a degree of perfection in their exercises at various villages, with 2 afternoons a week set apart for the purpose. From Harston, Thomas S Hayes; Robert Long; WP Rowley; SH Rowley. Western Cambs Association for the speedy apprehension and effectual prosecution of felons and thieves – AGM on 14 June, including Thomas Smith of Harston. Court case against George Jennings of Little Shelford for distributing ‘bad’ currency, witnesses included Mrs Tuck of Harston who had a ‘bad’ halfcrown from him, ‘refused’ at the village shop. Simon Flack, labourer, fined 6d + 2s 6d costs for driving a waggon + 2 horses without reins. A servant woman, ‘Rowling’, claimed £2 7s wages from her employer, William Brown of Harston. She left his service after ‘he held and shook’ her during an argument (her wages were £5 10s pa.) The judge said her action was unjustified, so ‘non-suit’. William Wiskin, labourer, of Harston, was charged with damaging trees, property of his landlord, Mr Long, fined 6d + 1s damages + 12s costs. Auction by Mann & Son on Oct 11, on the premises of Mr William Brown, who is relinquishing the farm. 5 horses and colts; 5 head of cow stock, swine, agricultural implements, a well-seasoned brewing plant consisting of an oak mash tun, under-back, liquor-back, 8-barrel round working tun, 2 fir cooters, 8 ft x 4 ft, copper, wort pump and pipe, 9-barrel and 4.5-barrel oak vats and several puncheons, hogsheads, barrels, kilderkins, firkins etc., sweet, in good condition. Various useful effects. Catalogues from auctioneer. Mention of Mrs (Mary) Cornell, ‘the Harston carrier’, at The White Swan. Auction, Mann & Son, 5 horses & colts, cows, swine, agricultural implements, brewing plant etc. Charles Barlow, ‘ convicted thief’, charged with stealing a pair of boots, value 11s, propery of Mr WT Palmer, bootmaker, who left the parcel at the Bushel & Strike (in Cambridge) to be taken by the Harston carrier, Mary Cornell, to a Harston customer, but it was later found in the possession of the prisoner, who was committed for trial at the next County Sessions. Cambs Agricultural Show 1st prize (for shepherding) to F. Parker, employed by Mr Rowley. Marriage of Mr William Stockbridge of Harston to Susan Angell of Haslingfield. Advertisement for ‘Country Lodgings, genteely furnished apartments’, (enquire) A.B., Post Office, Harston. Auction, Mann & Son on 18 December on the premises of Mr Hunter who is removing. The utensils-in-trade of a baker, comprising flour bins, dough troughs and boards, scales and weights, bushel measures, oven peels etc, all nearly new. Useful bay mare and spring cart, harness & effects. Catalogue from auctioneers. Lot 1, 12 cottages or tenements with blacksmith’s shop. Outbuildings and gardens in the several occupations of Joseph Webb and others, at rents amounting to £37 per annum, in the centre of the village. Freehold, no land tax. Lot 2: A reversionary interest expectant on the decease of a Lady, now in her 75th year, a three-quarters share of well-built brick-and slate house with bake-offices, barn, stable, outbuildings, garden, orchard with a pump of excellent water, now in lease to Mr Reeves, baker, 12y unexpired at a rent of £45 per annum. Also, adjoining, 2 well-built brick-and-slate tenements, each of 5 rooms, with gardens at front, let to Messrs. Gwilliams & Sells at a rent of £16 per annum. Situated in the Main street, directly facing the road from Cambridge. Further particulars from the solicitors and auctioneers. Auction by John Swan & Son on Jan 31 by direction of Henry Hurrell: 700 larch and spruce poles, poplar and ash trees, leg & brushwood, on land close to the road. Accident, James Bowers, employed by Mr Rowley, fractured his legnear Trumpington while proceeding from Waterbeach to Harston, taken to Addenbrookes. For sale by auction on 7 January, or to let, by Mann & Son, at White Swan, a recently-erected brick & slate house ‘suitable for a family of respectability’, or might readily be converted to a Public House; 2 parlours, 6 bedrooms, kitchen, wash-house, cellar, brewhouse, yard, outbuildings, garden. In occupation of James Wisbey. Freehold, no land tax. Possession next Lady-day. Lost, a black & white Pointer dog. Mary Morley convicted of maliciously breaking a pane of glass at the home of Susan Northrop of Harston, ordered to pay 2d damages + costs. Marriage at Harston church, by Reverend AT Crisford assisted by Reverend FJ Durbin (bride, Elizabeth Parsons, from Meldreth). Auction by Mann & Son at the premises of William Brown who is leaving his farm, 4 short-horn cows with calves, 1 cow down calving, agricultural implements, 5 coppers (20 to 60 gallons), brewing & dairy utensils, furniture etc. Court case, executors of T. Silk vs. executors of W. Willimott of Harston to recover £15 for arrears of rent. Willimott had, on the demise of Silk, given up a property (a small freehold at Harston) to a Mr Hurrell, who had purchased the reversion. The solicitor for the defendant contested the liability on the ground that Willimott was an evicted tenant and it was not shown that the present defendant was the executrix of the late Willimott. His Honour would consider his decision. Cambridge County Court, insolvency case for examination, James Wisbey, carpenter & builder of Harston. Baptist Missionary Society sermon by Rev. J. Keed at Harston. W. Cambs Association for Apprehension of Felons, Harston members wre FW Rowley, Thomas Smith, William Whitechurch. Advertisement, wanted as governess, a young lady as teacher in a school, music and French particularly required. Enquiries to M.A., Post Office, Harston. Auction by Charles Wisbey, auctioneer, on 25 July, of 23 acres ‘cropping’ at Harston, adjacent to the Little Shelford boundary, on Mr Sheldrick’s land on the road from Little Shelford to Newton, comprising 15 & 5 acres barley, 3 acres clover. Credit until New Michaelmas. Marriage on 1 Aug by Rev Durbin, assisted by Reverend A Calvert, of John Langhorne to Henrietta, eldest daughter of William Long of Harston House. Court case, Thomas Purkins Brunt of Harston was charged with resisting and assaulting Robert Turner of the County police. The defendant was, on 21 May, intoxicated at White Swan Inn and was creating a disturbance, saying ‘he would not be turned out for all the policemen in the world’. He kicked and struck the officer several times, and after being bound over, he absconded. A £5 fine or, in default, a month in prison was inflicted. (Later, committed to Cambridge Castle gaol). Thomas P Brunt convicted of assaulting a police constable at Harston, 1 month prison. John Angle, labourer, charged with stealing a scythe, property of Joseph Payne of Hauxton, and a shovel, property of W. Churchman of Harston, claiming they were only borrowed. Case adjourned twice, then on February 1 1862 he was convicted of stealing turnips, the property of John Northfield, and fined 10s 2d. Voter list revision, including Harston, at Cambridge county court. 2 Hauxton teenagers charged with stealing ‘a penny-worth’ of barley from Mr William Wallace of Harston, one (‘Buttriss’) convicted & fined 6d. Sale, by private contract, of a freehold cottage residence in 1 acre, entrance hall, 2 parlours, 4 bedrooms, kitchen, pantry etc, including orchard and garden and outbuildings. Half a mile from Harston railway station. For sale, 4-bedroom cottage etc, apply Mr HJ LePipre, Harston. Addenbrookes Quarterly Court, has accepted a tender from Thomas Smith, Harston, to supply flour at 44s/sack. (Other suppliers were providing leeches, at 10s/100, and cod liver oil, at 6s/gallon). Cambridgeshire Hunt (including the Prince of Wales), were hunting near Harston and the nearby villages, but the fox escaped into a drain, and couldn’t be dislodged……..
To let, bakehouse, dwelling house etc, apply Mr Jordan, Harston. Cambs County Court, Barker vs. Eastern Counties Railway Company. John Barker (butcher from Stapleford) claimed that after he alighted at Harston station, the (residual) meat from Royston market ended up ‘in a filthy, unsaleable’ state in a sack at the station, and he sued the Company for £1 16s damages. The judge ruled that since he had been (by his own admission) drunk, and consequently ‘did not know what he was about’, he must take the consequences, case dismissed (however some witnesses were paid 5s costs, each). Willis (or Wyles?) Chandler, shepherd, in the employ of Mr Long of Harston, was apprehended under warrant by PC Turner while stealing 3 flower pots from the garden of the Rev FJ Durbin,, convicted, 21d hard labour. Mr W. Trigg, corn merchant, Harston, ‘continues his usual (Christmas) hospitality by providing roast beef & plum pudding for poor widows’ (?in the village). Election of Registrar of Births & Deaths for Shelford District, mention of Harston. William Howe of Harston, convicted of stealing pork, value. 1s, from Arthur Cambridge, pleaded gulty, sentence 6 weeks hard labour. Court of Bankruptcy, – Reverend Alexander Watson, of Harston Vicarage, with debts of £1600 and assets of £400 applied for an order of discharge. His bankruptcy was attributed to ‘connection with Bedford Chapel, and 2 Chancery suits’. Death of Margaretta, grand-daughter of John Littell Bridge of Shudy Camps and Harston. John Henry How, labourer, charged with stealing two half-pint mugs from the coprolite works of Mr Alfred Gilby of Harston – How arguing that a charge for ‘wear and tear’ was unfair. Case dismissed. Choral festival at Melbourn, Harston provided 33 choristers. Auction by Mann & Son on 20 May, wheelwright’s stock-in-trade, tools etc. at the premises of Mr William Wallis, wheelwright, who is retiring. Well-seasoned materials: 2, 3 and 4 inch ash planks, cart and gig bodies, naves, felloes, spokes, pit and cross-cut saws, blacksmith and wheelwright tools and miscellaneous items. Court case, William Coxall and John Ham(m)ond, stewards of the Amicable Benefits Society at Harston, were ordered to pay arrears of sick pay due to Robert Newman, a member of the society for 35 years, who was in receipt of 5s a week from the club ‘for a long time’. The stewards ‘allowed him to fall into arrears with his subscriptions by subterfuge, so he was (deemed to be) no longer a member’. This was described as a ‘subterfuge’ so they were ordered to pay. Auction by Wentworth & Son at the Waggon and Horses on 18 June, a freehold slated cottage with garden and orchard, the first house on the right at the Cambridge entrance to Harston. Comprises 2 parlours, kitchen with oven and pump, pantry, cool cellar, 4 bedrooms, 2 staircases and a small paddock. Lately in the occupation of Mr LePipre (see next entry). Half the purchase price may be mortgaged for 5 yrs at 5% interest. Bankrupt (in London), Mr Horatio James Lepipre of Uxbridge, formerly of Harston. Creditors unsecured, £313.11s 6d, but assets nil. ‘’Not entitled to discharge … extravagant living” etc. Discharge order ‘suspended’, ‘without protection’. Boat excursion on 16 June, the 8th anniversary of ‘Friend-in-need’ boating excursion on the Cam – the first boat contained the Harston ‘Young Men’s Brass Band’; the second, the ‘Cambridge Juvenile Fife & Drum Band’ – terminating at The Jolly Waterman, and after dinner they all amused themselves on The Green, at games of ‘trap-and-bat’, or by dancing. John Covell & John Cambridge of Harston were charged with assaulting pc Turner, and Elias Northrop, Swan Rayner & Frederic Barker were charged with being drunk & riotous on 7 June. The pub landlord, Thomas Tuck of the Coach & Horses, called pc Turner at 11 pm whereupon he was assaulted. Cambridge was fined £1 + costs, Covel & Rayner, 10s + costs, Northrop & Barker 5s + costs. Thomas Wren, coprolite, digger, charged with assaulting James Taylor at Harston, fined 5s + 15s expenses. John Chase & John Ottowell of Wisbech, charged with theft of a half-pint measure, value 8d, property of Christopher Wedd (publican at THe Green Man) at Harston. Mug was later discarded in the road. Ottowell – guilty – 1 month prison, hard labour. Death of Mr Watson, late of Harston, aged 53. Advertisement, wanted, a steady, active young man for Journeymen Bakers – apply to Mr Reeve of Harston. Following the death of Mr W Stearn, his plumbing, glazing & painting business is to be disposed of. Excursion by (Cambridge) School of Art (members) to Harston, arriving by rail, then by the kindness of the Vicar and Mrs Durbin they played croquet and practised archery, and visited the ‘beautiful grounds’ of Mr Long (‘well-ordered hothouses’), Mr Hurrell (‘prettily-arranged parterre’) and Mr Rowley which were thrown open to them. ‘Aunt Sally’, entertainer; songs by Miss Feil & Mrs Sippel. Unfavourable weather then confined them to the church for sketching, and prizes of £1.1s and 10s 6d were announced. After tea, in a tent on the vicarage lawn at 6 pm, the University Rifle Band performed, concluding with the National Anthem. They then returned (to Cambridge) at 9 pm. Prizes for their artwork were later awarded, see 23 August, 18 October. Marriage of Mr David Lloyd of Cambridge to Eliza, 3rd daughter of the late Thomas Brown of Harston. West Cambs Agricultural Society at Royston, awarded a prize to Mr Rowley of Harston for shepherding. Harston (river) bridge repaired by Mr Alfred Jude at a cost of £1 5s. Commitment to The Castle (?gaol?) of Henry Marking (Markham?) of Harston, for cutting and wounding his brother, remanded. Later ‘bound in recognisance of £100 + sureties, to keep the peace for 6 months’. Fred Stockbridge of Harston was charged with assaulting John Hood of Harston; case dismissed by the judge as a group of people ‘seemed to be in league against the defendant’. Samuel James of Harston, charged with receiving stolen property, remanded in the Castle gaol. Moseley vs. Watson, the plaintiff claiming 17s 6d for removing sand piled by the defendant on the footpath at Harston – much argument – ‘non-suit’. Henry Beckwith charged with stealing reins, value 5s, see below. Henry Beckwith of Newport convicted of stealing reins, value 5s, from Mr Sydney Smith of Harston, and then trying to sell them in Haslingfield, 1 month hard labour. Sale of trees belonging to H Hurrell and FW Rowley in Harston. Marriage of Reverend W. Birch Wolfe of Wood Hall, Essex, to Marianne, youngest daughter of the late Robert Richards of Harston, barrister-at-law. Death of Mrs (John) Page, her late husband having been a ‘toll-hirer’. James Savage, indicted for cutting down a fence, value 5s, property of Mary Stearn; he’must ‘give up the faggots & pay costs’. Auction, by Mann & Raven, auctioneers, on 12 Mar, the materials of a bakehouse and oven, plus furniture, also a fat pig, 4 ewes and lambs, being the property of Mr Thomas Jordan. Auction by Mann & Raven on 6 Aug, Lot 1, centre of Harston, 3 tenements and premises occupied by John Morland and others, with garden and orchard, freehold, tithe-free. Lot 2, near the windmill on the Newton road, arable land, 3 acres, 9 perches, freehold, tithe-free. To let at Harston, 5-bedroom house with stables, coach house, garden, orchard; apply Mr Hurrell. Pony, cart and harness, all in good condition, to be disposed of, at the Old English Gentleman. In ‘Captain Roberts vs. The Cambridge Chronicle’ (Proprietor Mr CW Naylor), court case, the following from Harston are supporting, and are subscribing to, Naylor’s cause: John Jones, T. Smith. Robert Turner, pc for Harston, was charged by Charles Cornwell, a jobbing gardener, with maliciously damaging his door (5s damage), after he had attended the Harston ‘feast’ and ‘became drunk’. Cornwell also alleged that Turner’ dragged him out of the Waggon & Horses, to which he had been invited by Mrs Tuck, the landlady. The complainant said he was a ‘ticket of leave’ man, having served a penal colony sentence, after which he frequently had his house searched for stolen property. (Witnesses said the complainant too, was drunk). Charge dismissed, but Turner would be disciplined for drunkenness, by the Chief Constable. George Vincent of Harston was committed to the castle (gaol) for obstructing the station master in the execution of his duty. Mr Smith, surgeon, of Harston, is a member of the ‘Friends in Need’ society. Court cases. No. 1, John Cook, a tramp, under remand, charged with having a gold-plated bracelet at Harston on 24 July, supposed to be stolen, prisoner claimed he had found it, property (not yet claimed) has been retained at the Police Office for further investigation. No. 2, George Knivis of haslingfield, aged 14, was charged with assault of 2 other boys, namely Arthur Covill and William Cornell of Harston, however the real complainant seemed to be the Reverend J.T. Durbin, their employer, who had been greatly annoyed by boys bathing and chasing his cattle. Defendants were fined 2s 6d plus costs, and 6d plus costs respectively. (A third charge of cruelty to a horse was dismissed through insufficient evidence). For sale, by Mann & Raven at The WEhite Swan, 3 tenements occupied by John Morland and others (lot 1), and arable land adjacent to the Newton Road near the windmill, 3 acres 9 perches (lot 2). Court case, Matthew Stittle was charged with assaulting Mary Worthrup at Harston on 14 Aug. The complainant prevented his child from entering a harvest field to glean at an improper time; Stittle then took umbrage and struck her near her ear so that she fell down, insensible. The defendant admitted assault, but urged ‘her provoking language’ as extenuation. He was fined 5s plus costs. Two 16-y old ‘gypsy tramps were committed to the castle for allegedly leaving 2 iron chairs and an iron bar on the railway line at Harston, thereby endangering the rail passengers. An engine ran over the iron bar and broke it in two. The following were winesses: William Tuck (‘foreman of the permanent way at Harston’), George Durham, signalman at Harston, William Rayner, labourer, Thomas Buttress, pc Robert Turner. Both suspects eventually acquitted. Harston Harvest-home Tea Meeting, members of the church and congregation under the pastoral care of the Reverend J. Garner assembled in the chapel (despite severe storms), Garner having ministered for 25 years at Harston The proceeds (£15) were presented to him as an expression of the confidence and esteem of his friends and neighbours. Court case, Robert Fox, labourer, employed by William Hurrell at Harston, was charged with leaving a gate open at the crossing of the Great Eastern railway on 9 Sept. Mr Hurrell (the land owner) complained of a defective fastening, but as the defendant had already pleaded guilty, he was fined 1s with 12s 6d costs. Mr Rowley, junior, of Harston had a minor accident wherein he was thrown from a horse & gig. Death, on October 16, of Mr Samuel Northfield, farmer, aged 24, after a long and painful affliction borne with fortitude. He leaves a wife and 2 small children. Inquest at THe Green Man (Fred Barlow, coroner) on a young child accidentally killed (ie poisoned) by laudanum, which was incorrectly sold at the village shop and administered instead of the intended ‘Godfrey’s Cordial; jury verdict, ‘death from laudanum administration by mistake’. Harston ‘carriers’ (to & from Cambridge) include MWS Cornwell, ‘Bushel & Strike’, TTS Tuck, ‘Little Rose’. Death on 12 December of John Bridge, son of the late Major Bridge and grandson of John Littell Bridge of Shudy Camps & Harston. Auction by Charles Wisbey at the Red Lion Inn, Petty Cury, Cambridge, of The Old English Gentleman pub, Harston, at the corner of the Barkway and Royston roads, brick and tile construction, with yard, sheds, plumber’s workshop and stable, also a cottage with gardens and arable land, 2 acres, 3 roods, 13 perches, in the occupation of Mrs Stearn and Nortrop (sic), copyhold. Maririage, Mr R Whitehead of Harston to Elizabeth Ingle of Cottenham. Death of Charlotte Hardwick on 24 January. The (new?) registrar (of births and deaths) for Shelford (Mr Higham) has noted as ‘cases of longevity’ in Harston, 1 male aged 80y, one female, 87y (and from all the surrounding villages, only one > 90y, being 102 yr-old Mary Skinner of Haslingfield). James Savage of Harston charged with assaulting Elizabeth Beaumont, also of Harston, fined 6d, costs split between the defendent and the complainant. Mr Gilby (a young man), Master of the Harston Fossil Pits, gave all of his labourers (ca. 30) a treat of a ‘real good Old English supper’ on 29 Jan at the Old English Gentleman, hosted by Mr and Mrs Whitehead, the owners. The Harston Brass Band was in attendance ‘playing in good style’. ‘Always pleasing to see a Master and his labourers mutually united’. George Tuck & William Beaumont of Harston were charged with trespass, & damage to herbage and hedges, by Mr Long ‘who wanted to stop people from using his field as a thoroughfare’. Magistrate ordered payment of expenses only. Expenses of ‘building & repair of ecclesiastical residences’: Harston’s ‘mortgage’ with the Governors of ‘Queen Anne’s Bounty’ (since November 1847) now stands at £700. Harston members of Cambs & Isle of Ely Agricultural Society: Long & Rowley. Wentworth & Son, auctioneers, of Cambridge, were instructed by Major Pemberton to auction on 31 March, at Newton, near Harston station, a flock of grey-faced ewes and lambs, hoggets and a tup from the flock of Jonas Webb, also 8 carthorses, mares, one with foal, a 3y colt (a good harness horse), young dairy stock, Ayrshire, Alderney and other cows and buds, some in calf, also some pigs and a young brawn. ‘Dead stock’ comprising 4 Tumbril carts, a light waggon, 3 Crimean carts, ploughs, harrows, rolls, sacks, harness, a water cart, an oilcake crusher, a chaff-cutting machine, a scuffler, iron & wood rolls, a 10-coulter corn & seed drill, a 2 horsepower reaping machine, a horse hoe, garners and other turnip cutters, a weighing machine and weights. J. Foxall & T Churchman of Hauxton, convicted of assaulting the Harston station-master on 8 April, fined £1 + 13s 3d costs, or 1 month in prison. Fred Baker & Sam Cambridge, of Harston, convicted of trespass and theft of game on Mr W Hurrell’s land on 24/4, fined 30s + costs, or 6 weeks hard labour. A sword exercise was won by Pte Long of Harston at the Duke of Cambridge’s Troop of the Duke of Manchester’s Light Horse Volunteers at Sawston. Advert for Royal Farmers’ Insurance Co., offering insurance (especially) against crop damage by hailstorms – 6d per acre. Harston agent, Mr JW Barton, corn dealer. At the annual anniversary of the Free Shepherd Society at the White Swan on July 5, 165 members met at the Band Room, with a mounted ((Mr Cornell’s horse) Guard of Honour, with full uniform, helmet and sword, they then processed through the grounds of H. Hurrell, to the gate of the Reverend Durbin, through the grounds of Harston Manor (F. W. Rowly), and then to Mr F.H. Smith and then to the White Swan. A large tent had been lent by J. Philips, they played cricket and other games, and after supper, 2-3 hours were spent ‘in the usual way’. Officers presiding were: F. Butler, J.Newling, A. Wisby, A. Jude. Court cases, No.1, Joseph Morley, labourer, pleaded guilty to stealing a donkey, the property of William Long of Harston. The judge ‘could find nothing in the prisoner’s favour’, so sentenced him to 3 months prison with hard labour. No.2, James Bryden (31), a labourer, was charged with ‘uttering’ a counterfeit half crown to Mrs Emily Tuck at the Coach and Horses Inn, for beer. Some of the silver in his pocket was also ‘bad’ by a nitric acid test. He was sentenced to 12 months prison with hard labour. (A fire in a field between Trumpington and Hauxton caused £680 damage to 6 wheat stacks). Marriage, Reverend Arthur Calvert MA, fellow if St Johns College, Cambridge, to Katherine, 2nd daughter of William Long of Harston. For sale, ‘The Old English Gentleman’ public house, plumber’s shop, land etc. William Rushbrook, labourer of Harston, charged with stealing 3 sheaves of barley which had fallen from a cart, property of Mrs Watson, case dismissed with a caution. Marriage (in Cambridge) of Mr Samuel Davison, grocer, to Mrs Ann Stearn, both lately from Harston. James Phillips, a tramp, committed to the castle for 14 days for vagrancy at Harston. Marriage of Smith H. Rowley, 2nd son of F.W.Rowley of Harston Hall, to Grace Balls, 4th daughter of Charles Bell, JP, of Cambridge. Court case, Robert Wiston (Wiskin? ), labourer, of Harston, labourer, was charged with stealing a shovel, value 2s 3d, from a shop (Moses Mason) in Haslingfield; he pleaded guilty and was committed to the castle gaol for 6 weeks. Robert Moore of Little Shelford died after breaking his leg at Harston, he slipped while acending a cart, ‘delerium tremens’, cause of death, ‘traumatic delerium’. Eastern Counties Asylum for Idiots (charity), election of inmates (8 boys, 2 girls to be admitted in 5 weeks time); the following ? supporters? were named for Harston: Rev FJ Durbin, H Hurrell, AA Jude. Auction of large wych elm & ash timber trees plus leg wood plus top wood, by AD Claydon on 17 Feb, in the Crofts & Hall Yard Close, adjacent to the main road, being the property of William Long. 2 months credit allowed. Death at The Lodge, Harston of Robert Brice from Grantham, a corn merchant, aged 45. Harston bridge was painted at a cost of £3. W. Chandler of Harston, charged with being drunk, at Hauxton. WF Young, station master at Harston was charged with assault against James Kidman, who claimed he ‘took him by his collar & pushed him off the platform – fined 10s + costs. Anniversary procession and dinner, Loyal Free Shepherds Society (160 members attended), with Harston Brass Band, a mounted, uniformed, guard of honour, taking in the grounds of H. Hurrell, W Long, the Vicarage, FW Rowley (Harston Manor), JH Smith, residences and then the Lodge, where Mr & Mrs Cornell provided dinner in a tent, with a cricket match after. Officers: GJ Gouldthorpe WM, J Ellis DM, W Stockbridge, PH, A Jude, Treasurer & Secretary. Duke of Manchester’s Light Horse – field day – participants including HA Long, S and WT Rowley, T Hayes. Marshall (plaintiff) vs. Hurrell (defendant), court case to recover ca. £24 for supply of lime etc to Hurrell, who was the landlord, (long deposition), jury found for the defendant. Turnip seed for sale, Sutton’s Early 6-weeks Short Top, grown at Harston, price 9d/lb, apply J.W. Barton (?Burton), corn dealer, it will be ready by Michaelmas if sown now. John Newman of Harston charged with evading the toll-bar at Great Abington. Addenbrookes Hospital Building Fund, contributions from Mr TH Smith of Harston Mill and from Harson church collection. Lost, a gold hunting watch on the road between Harston and Foxton, £2 reward for its return, at Harston Mill. Frederick Northrop & John Hammond, charged with damaging a door by kicking it, 2d worth of damage, case dismissed, but Northrup ordered to find sureties to keep the peace. Auction, by Mann & Raven on 4 Jan, of 60 ash, elm, willow, also black poplar timbers, poles and brushwood, being the property of F.W.Rowley Esq. Cambridge Volunteers Town Corporation, marched (at 11 am) from Market Hill, (with Major Barlow on horseback),Cambridge to Harston, where they performed exercises and were entertained by Mr Long, returning at 3 pm. The ‘poor widows’ of Harston were provided with ‘a good repast’ on Christmas Day, comprising roast beef & plum pudding, by Mr W. Trigg, Harston merchant. Amongst the (many) Patronesses of the 2nd Admin. Battalion of Cambs Rifle Volunteers, is listed Mrs Durbin of Harston. A new reading room has been opened in Harston, ‘affording the mechanic & labourer the opportunity of seeing the daily & weekly papers’, books also donated, supporters Rev FJ Durbin & H Hurrell (the latter having provided the room). At Cooper’s Hill Quarry in Harston (is being installed) a ‘new system of works’ for the recovery of fossils and coprolites, by Mr C. Cooper of Bassingbourn. A shaft (is being) dug ‘to a considerable depth’ with heading(s) formed to run diagonally to the main shaft, with tramways using steam power, to save labour. The engines being fitted by Mr Cooper are modern and of an approved style, Men have been working night and day, and a ‘vein of superior quality found’ (Mr J. Papworth, manager). ‘The unoccupied labourer will (thus be) employed (so that) homes suffering want will become homes of plenty’. ‘Penny readings’ – meeting in the schoolroom, chaired by Rev F Durbin who was also a reader, together with Mr Finch and someone from Cambridge. Also included songs & glees, sung by the Misses Reeve & Stockbridge, Messrs Jude & Butler, Mr JC Christmas, Mr Finch, Mr Donkin etc, with Mrs Jude & Miss Stockbridge accompanying. ‘Wanted’, a collar and harness maker, apply C.Wedd, saddler, Harston. Death on 19 March, aged 38 y, of Henrietta, wife of Henry Hurrell and youngest daughter of Rev William Metcalfe, Rector of Fowlmere. Cockett & Nash, auction of arable land, 50a, 8p, formerly the property of the late William Whitechurch, fronting the road from Harston to Newton, being allotments nos. 21 + 22 on the Newton Inclosure Award, of which 45a 32p is freehold, 4a 3r 16p copyhold, of the Manor of Newton & Hauxton. (See April 21 below). Election of County Guardians: William Long (Harston) is listed. Auction at The White Swan in May, a brick & slate dwelling with cellar, hall, parlour, dining room, kitchen, pantry, 3 bedrooms, detached wash-house etc, and a pump of excellent water, a garden with fruit trees, ca. 1r 10p, all occupied by F. Hall. Tithe-free, land tax 1s 10d. Cambridge Horticultural Society, prize for roses to Mr J Butler (+ similar announcements on many succeeding occasions, often citing Butler & Hurrell). Cockett & Nash have sold 45a 32p of arable land near the Newton & Harston roads, for £4420, and 4a 3r 16p for £430, all purchased by Mr Mann for C. Pemberton. Death on 29/4 of John Jackson aged 31y. Entertainment in the (new) Reading Room: chaired by Rev Durbin, readings & songs, performers mostly as on 17 February, with the addition of the Rev Andrews. To Let (Wentworth & Son, Cambridge), a cottage with 2 sitting rooms, 5 bedrooms, kitchen, etc., plus a stable, chaise house and a small orchard, the house either furnished or unfurnished. Thomas Batson of Cmbridge was charged with stealing ‘wheat sweepings from the (railway’s) Green Shed at Harston, sentence 21d hard labour. Auction, (Wentworth & Son), of modern household furniture in Harston, a capital mahogany half-teaster, a bedstead, feather beds & bedding, a rosewood Cheffioneer with a plate-glass back, dining, Pembroke & other tables, Brussels & Kidderminster carpets, chests of drawers, washstands, walnut drawing room chairs, sofas, kitchen requisites, etc. The proprietress is moving. Field day & lunch for the Duke of Manchester’s Light Horse (D troop), commanded by Captain Towgood, at the Old English Gentleman at the invitation of William Long (with Harston Band, march past, loyal toasts etc – lengthy discourse follows). Sarah Rayner accused James Papworth (both of Harston) with an assault on her son, case dismissed, Sarah’s son bound over, 3 months. Death of William Fred Cooper, only son of Reverend F. Durbin, at St. Leonards on Sea, aged 15y. William Trigg, Harston, farmer of 70 acres, was a witness to a case of seed quality testing locally. Frederick Hammond of Harston, ‘fossil digger’, sentenced to 7 days hard labour for stealing a shovel. Albert Taylor, labourer, charged by Luke Jackson, publican with stealing a basket containing 200 walnuts value 2s. Fatal accident at the ‘fossil’ (coprolite) works in Harston, Joseph Cornwell of Histon slipped while wheeling a barrow, injured his knee and died a few days later – inquest (F Barlow, coroner), verdict ‘accidental death’). Mr F Hall, named as Harston agent for sale of bone manure & superphosphate fertiliser. A.D. Claydon, auctioneers, auction of household furniture on Dec 11, a basket chaise, harness, a small tumbril cart, a garden roll & other effects. A well-bred pony, quiet to ride and drive, all being the property of J. Sidney Smith, who is ‘declining housekeeping’. Penny Readings at Harston Reading Room on 4/1/1867, Rev. Hudson leading, Miss Stockbridge, accompanying songs on piano, sung by Mr A Jude, Goldthorpes, Northfield, Finch, Rutter etc. Auction of felled trees, by Mann & Raven on 24 Jan, walnut, willow, back poplar, and ash timbers + topwood. John Northfield, carpenter, found drowned in a ditch near where he was working, inquest at the Queen’s Head, suggested he had a fit, open verdict. Death, on Feb 21, of Mr Thomas Hays, 70y, ‘much respected’. Auction, by Mr J. Carter Jonas on 8 Mar: of poplar trees, ash & other poles; brush & legwood, in a plantation near the road, by direction of H. Hurrell. Albert Taylor (?Tabor? ), labourer, 18y, convicted of stealing a shovel value 2s from William Covell, previous conviction, 3 months hard labour. Sale by Mann & Raven at The White Swan, double tenement occupied by Thomas Northrop and another, adjacent to Christopher Wedd and the village green, annnual rent £6 12s 6d. Repair to parapet walls of Hoffer Bridge between Harston & Foxton. Death, Ruth Northfield, 17y, after a short illness. Chesterton Union Guardians, included William Long. Mr F Butler of Harston was one of the prize winners at the Cambridge Horticultural Show. Robert Scowen, charged by Thomas Wren with assault, but settled out of court. John Simons (?Simmons? ), tramp, charged by William Northrop, labourer, with stealing a jacket at Harston, 1 month hard labour. Death at Harston Rectory on 9 July, of Reverend Earle Welby, aged 81y. H. Hurrell won prizes for his horses (including mare with foal at foot) at various horse shows. Court case concerning the quality of ‘giant cinquefoin’ seed sold by JW Burton of Harston, also involving Mr Trigg, verdict for the (Foxton-based) plaintiff, Mr Sanxter. Birth on 5 Oct, of a daughter to the wife of Reverend F.J. Durbin, in Dublin. To let, 8-room cottage with garden & orchard, apply Mr Watson, Harston. Robert Wiskin of Harston, charged with stealing a coat and bag, property of James Hagger, remanded in custody. Eliza Beaumont accused James Cox of assault, defendant fined £1 + costs. Henry Myers, a tramp from Sheffield, was charged by F. Northrop & W. Cox, Harston labourers, of the theft of 2 shovels, value 4s, and was sentenced to 3 days prison. Robett Whiskin, labourer, 29y, charged with stealing a leveret, a bag and some peas, property of William Trigg of Harston, later sentenced, 3 months prison, for receiving stolen goods (see also November 2, 9 above). A fire on 17 Nov destroyed a wheat stack, being the produce of nearly 8 acres, value £160, the property of H. Hurrell. A labourer named Alfred Jackson was apprehended, his footprints leading to his cottage wre discovered, he admitted arson, and was committed to the Assizes. Ist Cambs Rifle Volunteer Corps marched from Cambridge (Market Hill) to Harston on 26/12, with their band playing, their destination being Mr Smith in Harston, for refreshment, followed by battalion drill in a nearby field; then lunch and returning by 4 pm. Robert Whiskin was accused of stealing a quantity of peas in Harston. Death of a young child (Jackson), followed by inquest (by Mr Barlow) at The Green Man, cause of death cited as ‘dropsy of the pericordium’. Auction by A.D. Claydon, of ash & elm trees & one large sycamore, with leg- & brushwood, from the premises of W. Long. The trees are lying in Thoroughfare & Hall Yard Closes, being handy for transit to the High Road. 2 months credit offered. To let, by Wentworth & Sons, a Harston country residence with 2 sitting rooms, 5 bedrooms, kitchen, scullery, garden back & front, 10 minutes walk from railway station. Road accident causing injury to Mr Jmes Campbell Bruce near Harston, William Scruby, farmer of Melbourn charged with dangerous driving of a gig. Robert Fuller, labourer of Harston convicted of being drunk, fined 10s + expenses or 14d prison. Samuel Cambridge, labourer, charged by John Hammond with stealing a pocket knife, value 2s, on 14/4 but case withdrawn on payment of expenses. Mary Goats, servant, charged & convicted of stealing books, clothes etc while in the service of Mr J Watson, farmer of Harston, 2 months prison. Railway advertisement for cheap day trips to Crystal Palace, London on Whit Tuesday, 9s6d first class; 5s2d second (’cov’) class from Harston. James W Burton, Corn, Coal, Seed & Coprolite merchant of Harston, agent for Lawe’s manure, offers Steam Ploughing & Cultrivating with Fowler’s Prize Engines. Mr Cambridge accused Rev F Durbin of trespass on and damage (by ploughing) of some of his land, verdict for the defendant. W. Rowley awarded a prize for the best riding & coaching (Hackney gelding) horse in a horse show. John Hammond charged G. & S. Cambridge (all of Harston) with assault, G Cambridge fined 5s + costs. ‘Wanted’, by a married man, a situation as a Farming Bailiff or Game Keeper; ‘good vermin destroyer’, address for replies, the Post Office, Harston (apply KL). Cambs MPs election: promotion of the return of Lord George Manners & Rt Hon Viscount Royston: supported by William Long, H. Hurrell, Rev. FJ Durbin, of Harston. To let: a public house at Harston, not identified (by Moyes & Son). Death of Robert Long, aged 27, second son of William Long of Harston, at Richmond, Natal, S. Africa. Luke Jackson (beerhouse keeper & coal merchant of Harston), charged by Phillip Pallet with ‘unjust weights & measures’, fined £2 + costs. William Long of Downham Norfolk was charged with stealing tools from the coprolite works at Harston, remanded. Edward Turner, a tramp, was committed for 10 days to the castle (gaol) for begging in Harston. Edward Swan of Whitechapel was charged with stealing 3 sovereigns from Mrs Frances Cornell, carrier, of Harston, by picking her pocket at the Bushel & Strike pub (? in Cambridge), remanded. Marriage of Emily Reeve of Harston to Mr Luke Cherry of Islington. For sale by auction, by Mann & Raven, of ‘The Materials of Harston Water Mills’: an assorted lot of beams, joists, rafters, floor boards, iron columns & plain tiles, at 11 am in a field adjacent to Cambridge Turnpike road. For Sale, 50 tons of Mangold Worzels, apply W.Wallis, Harston. Auction (by Nash & Son) on 25 Mar at the Swan Inn, of an Absolute Reversion to a Compact Residential Estate, on the decease of a lady, now in her 48th year. The property comprises 136a, 2r, 4p of arable land, pasture and woodland, together with a substantial Family Residence and Farm Homestall and 9a 2r 28p of Old Pasture in Burnt Mill Close, currently rented by respectable tenants at low rentals. George Cambridge of Harston is accused of maliciously knocking down a wall belonging to Thomas Hayes, fined 20s plus the cost of repairing the damage, plus costs. Inquest (by F Barlow) on death of Jesse Northrop, labourer, working for Mr Jackson, farmer & publican, he slipped off the shafts of a muck-cart, the wheel went over his body, verdict, accidental death. ‘Reversion’, to ‘a compact residential estate’, to be sold (Nash & Son, at The Swan Inn), ‘on the decease of a lady now in her 48th year’, ‘a very desirable property’. William & Elizabeth Jude of Harston charged with assaulting James Wing (?King) on 2/3, case dismissed with payment of costs. To let: a newly erected residence near the Cross, having 9 rooms + garden, 5 min walk from railway station, apply C. Wedd, saddler, Harston. Thomas Colville, 18, labourer, charged with ‘destroying’ coprolites valued at 2s6d by throwing them into a pit, fined 5s + 2s6d damages + 15s costs. Joseph Webb, simlar charge, had to pay 14s9d costs. Robert Skoen, 23y & Frederick Northrop, 22y, coprolite diggers, charged with being drunk & riotous on 24/4. Pc Wilderspin said ‘there was a lot of drinking & fighting, especially on Saturday evenings, and the charges ‘would have a salutary effect in suppressing the pugilistic displays indulged by some of Harston’s “sons of toil”. Skoen fined £1 2s 6d, Northrop (with previous convictions), 7d prison & must pay expenses. Mr F. Hill, Harston, is a supplier of manures for the Agricultural Manure Co. which includes bone & superphosphate of lime, for mangolds & turnips. Edward Charles Hamilton, a merchant at Harston, sought to recover £26 5s for assault, plus £6 15s for damage to his clothing, from Charles Stewart Parsell of Magdalene College, Cambridge. Jury verdict for the plaintiff, awarded 20 guineas in damages. To lert, newly-erected residence at the Cross, 9 rooms, garden etc. Allen Watson, grocer, and his assistant, Henry J Faircloth, of Cambridge were charged with ill-using a pony at Harston, it had sores & a large abscess caused by an ill-fitting saddle, however the judge directed the jury to dimiss the case as there was ‘no evidence of wilful cruelty. John Long, labourer, charged with begging at Harston, remanded 1 week on May 29, then sentenced to 3 weeks gaol, see report on 5/6/1869 (he had already been committed for a month in Swaffham gaol, having ‘torn up his clothes’ in Docking Union on 6/4). Fred Crock and John Staitch were likewise charged with begging at Harston, sentenced to 7d and 21d prison resp. Other gaol sentences for begging in Harston in 1869 included: Frederick Crook, 7d, and John Long, 21d, (reported on June 5), John Smith, 21d (reported on 10 July), Thomas Smith, 7d (reported on 5 November), William Anderson, 7d (reported in December). John Wyatt, labourer, convicted of riding without reins, fined 10s + costs. The Loyal Free Shepherds’ Society held their 21st anniversary meeting at the White Swan Inn on Tuesday. More than 200 members attended the dinner hosted by Mr & Mrs Cornell, with meat supplied by Mr Robinson. A marquee was lent by J. Phillips of Royston. The Barrington band played, and games of cricket and bat-and-trap ensued. After supper, glees, trios and songs were performed, and Mr F. Butler proposed 3 cheers for the host & hostess. Some members came back the next evening, to finish the feast. James William Benton, listed as as member of the jury at NISI Prius Court. A new lodge in connection with the Independent Order of Odd Fellows was opened at The Green Man. The host, Mr Haslewood, served an excellent dinner, after which the new lodge was inaugurated by ‘brothers, officers, and past officers’ of the Cambridge Lodge, numbering 30 or 40. 20 enrolled themselves as members. P.G. Eagle retained the chair, and the usual toasts were drunk and responded to. Cricket, ‘Mastrer H. Hurrell’s Eleven’ v. ‘The Village Boys’ eleven, Metcalfe’s wicket-keeping praised. Tea provided afterwards. Henry Hurrell, prize for Best Hunter over 5y at Cambs & Isle of Ely Agricultural Show. The following people were fined (6d each + 8s6d expenses) for trespassing on Mr Long’s land: Edward Northrop, 21y, Charles Dean, 20y, Alfred Simon, 21y, Robert Beaumont, 26y, Joseph Webb, 19y, John Parker, 26 y, Henry Smith, 30y, John Simons, ?y. To let, Charity Farm Haslingfield, ca. 74 acres, with or w/o coprolites access, apply ‘Secretary to Haslingfield Charities’, Mr W Wallis, Harston. Marrage of Mr Frederick Hance, Harston station-master, to Miss Emma Middleton of Wisbech. Celebration service to be held at Harston church ‘on its restoration’, the Lord Bishop of Ely to preach, access by train. Long and fulsome article on the restoration of Harston church. ‘Harston has a population of ca. 800’ When Rev Durbin came, he said ‘the high pews made it resemble a cattle-market’ -so now replaced, the roof repoaired, the old oak pulpit moved from the west arch, renovated & placed on north side of the chancel arch. New reading desk on south side with carved oak bench behind. Windows reglazed with (mostly) plain gass, walls cleaned & re-plastered. New carved rood screen (oak) reredos now has ‘the 10 commandments, the Lords Prayer & the Apostles’ Creed ‘ in the Elizabethan character with illuminated capitals’. There are bible texts over the alter (fashioned by the vicar’s wife), the woodwork being installed by Mr Joseph Stubblefield of Newton, the stone by Mr Clayton of Cambridge, and the plastering, heating etc by Mr Jude of Harston. THe work took 3 years and cost £500. There is to be a special ceremony (‘High Day’) attended by an ‘aristocratic congregation’ …… (final para on next page, not accessible). Robert Reeve, Harston, fined 4s + 11s costs for selling bread from a cart without scales & weights ‘as the Act requires’. W Rowley & H Long, gave speeches at an anniversary dinner held by the Histton, Girton & Impington Agricultural Society.